When was your air conditioning last cleaned and sanitised? Air conditioning cleaning is not just a matter of removing filters and cleaning them. This leaves the majority of contaminants still in the unit. Effective cleaning of your split system or ducted air conditioning, requires professional assistance. Clean units run more efficiently, reducing energy consumption and saving you money. Control the growth of pathogens for a period of up to 12 months. How does my air conditioning get dirty? 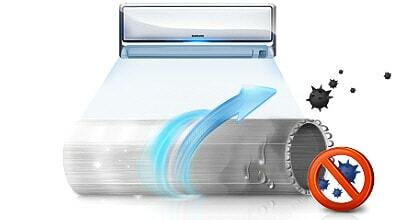 Air conditioners work by circulating the air – air is drawn into the unit from the room space. It is then cooled by passing through the cooling coil and returned into the room. Airborne dust, smoke, mould or any other form of contaminant within the area will also be drawn through the air conditioner. Filters will NOT stop all materials, this results in contamination build-up beyond the filtration. Due to condensation, the cooling coil is often wet when the unit is operating– an ideal environment when mixed with dust for mould and/or bacterial growth to flourish. You may regularly wash the filters, however contaminants that are deep in the system will re-contaminate the filters and louvres quickly. Consequently, mould spores and dust will continue blowing throughout your home. What should be done to clean my air conditioning unit? For effective sanitising, all internal surfaces need to be treated… including the cooling coil. DAS undertakes this without removal of the unit from the wall, by using purpose made equipment. This includes a water catching ‘apron’, low pressure water sprayer and foaming coil cleaning agent. The resulting cleaning and sanitation is reliable, effective and efficient. This also minimises our onsite time for your convenience. There is an increasing awareness that having mould in the home is not only unpleasant, but potentially has a serious impact on our health. In fact authorities have now rated mould in living and work environments at the same hazardous level as Asbestos – HAZARD 1! Are you, or any member of your family, suffering from asthma, sinus infections, constant feelings of fatigue, ongoing cold or flu symptoms, memory loss, irritation in the eyes or air ways? If so, it may be time to have a close look at the actual health of your home (and in some cases workplace too). If you can see dust and dirt just beyond the louvres, you can be sure the internal area of the air-conditioner is contaminated. The good news is that you can rid your home air conditioning system of unwanted mould, dust and general debris that bacteria and germs can adhere to. 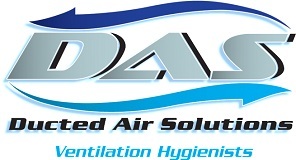 DAS delivers a prompt service throughout SE Queensland and Northern NSW for cleaning and sanitising all air conditioning models. This includes split system, box, cassette, suspended air-conditioner units and ducted systems which includes Air Handling Units. Environmentally friendly products used by DAS are proven to kill mould and defend against its return long term. DAS utilises modern purpose made equipment to ensure prompt and clean in-situ remediation.